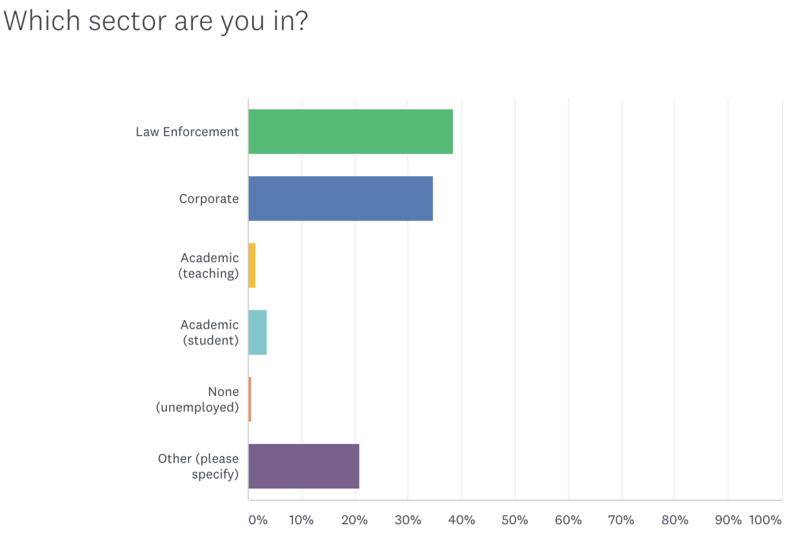 Earlier this year, Forensic Focus conducted a survey of its members to find out a bit more about them, their roles in the industry, and common challenges facing digital forensic practitioners today. Below is a brief run-down of the results. First of all, some demographic details. The majority of our members are situated in either the USA (36%) or the UK (22%). Other countries represented include Australia, Belarus, Belgium, France, India and Poland. 89% of respondents were male, and 11% female. Law enforcement was the most popular sector, with 39% of respondents; slightly behind it at 35% were people working in the corporate sector. Among those who answered ‘Other’ were retired people, consultants, and individual freelancers. The vast majority stated their position as ‘Analyst’, with ‘Technician’, ‘Director’ and ‘Manager’ closely behind. October 15, 2018 in LSC Posts. ← Opinion: Is ISO17025 The Right Standard For Digital Forensics?